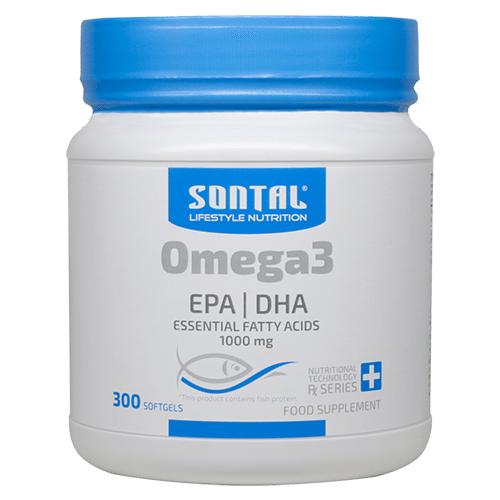 SONTAL Omega 3 is a scientifically proven dietary supplement containing essential fatty acids that have numerous health benefits for your brain, heart, eyes, skin and joints. Heart and mental disorders become a bigger concern as your body ages. Stop neglecting your health. Protect your body by taking SONTAL Omega 3. You can help protect your body against brain dysfunction, heart disease, high cholesterol, blood pressure, diabetes, arthritis, osteoporosis, depression, joint pain and macular degeneration. Maintain heart, eye, skin and joint health. Protection against common serious diseases. Directions for use: As a dietary supplement adults and children older than 12 should take 1 (one) soft-gel twice daily or 2 (two) soft-gels once a day before meals, or as directed by a healthcare practitioner.